Replace filename with listing title - if enabled, the uploaded photo filename will be replaced with listing title. Prepend listing id to filename - if enabled, listing id will be prepended to the photo file name. 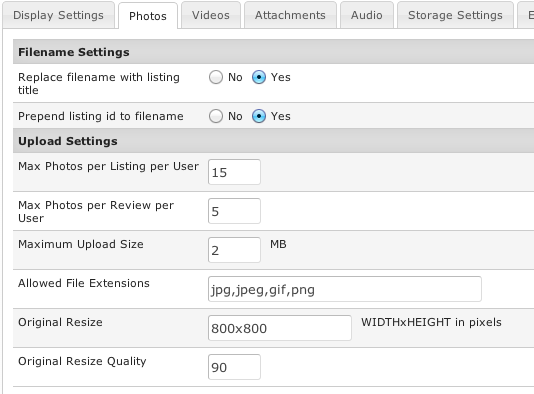 Max Photos per Listing per User - choose how many photos each user will be able to upload per listing. Leave blank for no limit. Set to zero to disable uploads. Max Photos per Review per User - choose how many photos each user will be able to upload per review. Leave blank for no limit. Set to zero to disable uploads. Allowed File Extensions - enter the list of allowed photo file extensions, separated by commas. Original Resize - the uploaded photo will be resized to the specified dimension if larger. Leave blank for no resizing. Default is: 800x800. Original Resize Quality - choose the quiality of the resized photo in a scale from 1-100. Default is: 90.